One of the drawbacks of a traditional chlorinated pool is the feeling it leaves on your skin after an hour or so. Your skin can become dry and chalky, hurt your eyes and have a pungent smell. Unfortunately, these drawbacks can keep swimmers clear of the pool. Nonetheless, the thought of cutting through the sparkling blue waters of a pool in the middle of the summer heat wave is incomparable. With saltwater pools that thought isn’t far-fetched. 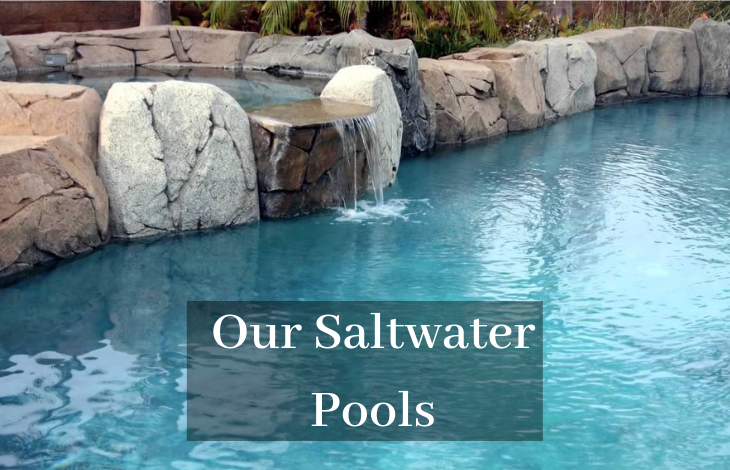 A saltwater pool is an alternative to your traditional chlorinated pool. It runs on a different filtration system. It is true that saltwater pools don’t require chlorine tablet or granules, but they still do use chlorine to maintain the cleanliness of the water. The pools use chlorine generators to make chlorine from salt instead of relying on concentrated chlorine tablet. What makes saltwater pools so much different than chlorinated pools? Unlike chlorinated pools, saltwater pools offer a comfortable swimming experience. Chlorinated pools are known for irritating the eyes and causing itchy skin. Although saltwater pools are saline like ocean water, they have little salt concentration. The water in saltwater pools has less than a tenth of salt concentration found in ocean water. This is almost the same amount of salt concentration in the human body. Moreover, chlorine generators in saltwater pools prevent the production of chloramines that cause eye irritation and itchy skin. The cost of having a saltwater pool in your home can be high, but despite the initial installation costs, the saltwater pool system makes financial sense in the long-term. Saltwater pool owners cover the value of the initial investment within a few years through savings on chemicals and maintenance. The maintenance cost of saltwater pools is only 50% of the cost of traditional chlorinated pools. Moreover, saltwater pools don’t require owners to purchase chlorine chips. Salt in saltwater pools is ten times cheaper than chlorine and has little fuss in handling. Chlorinated pools are known to cause health problems. Aside from the irritation, the pungent smell of chlorine can cause an anaphylactic reaction in some swimmers. If you are planning to have an indoor pool, saltwater pools are the best choice if you don’t want your house to reek of chlorine. The organochlorines and chloramines generated in traditional chlorinated pools also aggravate symptoms in some conditions. Asthmatics cannot put up with the smell of chlorine, sometimes resulting in an attack. Moreover, chloramines worsen symptoms in patients suffering from emphysema. In traditional Chinese medicine, salt is considered to have numerous therapeutic benefits in the immune, nervous and integumentary systems. Salty water has antimicrobial and detoxifying properties. The installation of saltwater pools has dramatically surpassed that of chlorinated pools. The low maintenance costs, the health benefits and environmental benefits make saltwater pools attractive for both hotels and residential homes. The bonuses have seen saltwater pools move to market dominance and force the fade out of traditional chlorinated pools. If you are considering installing a swimming pool, why not embrace the trend of saltwater pools?